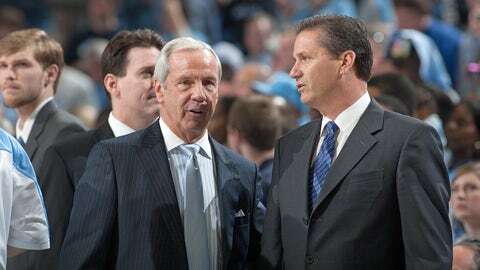 Kentucky and North Carolina share the top spot in the USA Today preseason coaches poll, which was released on Thursday afternoon. The Wildcats sent seven to the NBA Draft last spring, but John Calipari does bring back sophomore point guard Tyler Ulis and reserve forward Marcus Lee, while Alex Poythress returns from an ACL tear he suffered last December. They are joined by another heralded recruiting class that includes Skal Labissiere, Jamal Murray and Isaiah Briscoe. Aside from shooting guard J.P. Tokoto, North Carolina brings back its entire team, led by Marcus Paige, Brice Johnson and Kennedy Meeks. The Tar Heels also retain the sophomore trio of Justin Jackson, Joel Berry and Theo Pinson. Rounding out the top-5 was Maryland in third, followed by Duke and Kansas. The Big Ten and Big 12 each had five teams ranked in the preseason poll.